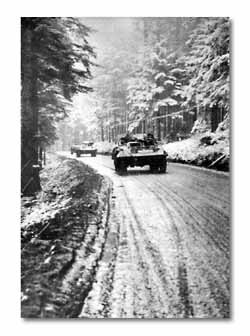 The campaign in the Vosges was beginning to resemble the fighting in Italy. Rain gave way to snow, and returned to cast hardships on the doughboy. Men of the 142nd took up the Divisions attack on November 5 as they edged their way down the Les-Rouges-Eaux Valley, sandwiched deep in the heavily wooded hills of the Foret Dominiale Du Champ. Progress was slow at first, visibility through the mass of growth very limited. Craftily planted mines in the dense foliage made every step a cautious one. Bitterly it rained again and again during the operation, and at the last a heavy wet snow whitened the battlescene. Tired T-Patchers, without shelter, rainsoaked and cold, fought on for days without a let-up. The enemy was forced to fall back continually until all of the large forest that had enclosed the "Lost Battalion" was cleared. La Houssiere and Vienville, towns at the edge of the Corcieux plain, were captured on November 11. 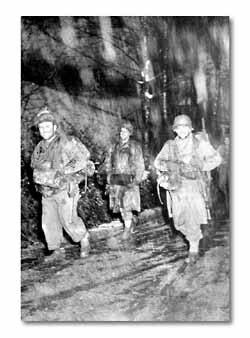 Doughboys of the 142nd Infantry trudge down narrow, snow-covered Les Rouges Eaux Valley. 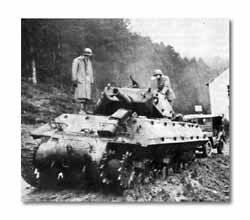 German bazooka fire knocked out this tank destroyer in valley battle. S/Sgt. 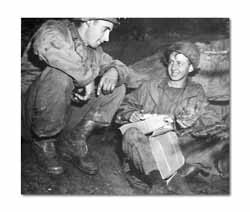 Thomas E. Bonhannon, 132nd Field Artillery, ogles a Christmas fruit cake just received by Pvt. Placide LaBelle. 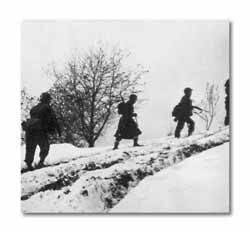 The 3rd Battalion, 141st, moves up to new positions in snow. Back in the States generously-providing parents, wives and sweethearts obeyed to the letter the Postmaster Generals order that overseas Christmas boxes be mailed early. The resultyuletide came to the Vosges in mid-autumn. To puptents in Tendon, to humble homes in Herpelmont, and, to chateaus in Lepanges, the mail clerk in his traditional December role of Santa Claus bore premature gifts of fruit cake, toilet articles, and woolen sweaters. Beginning the last week in October, the Division Post Office handled many thousands of packages, averaging seven to a man, until by Christmas Eve there was little need for Joe to hang out his water-soaked stocking. Prancer and Blitzen had been too fast this year. 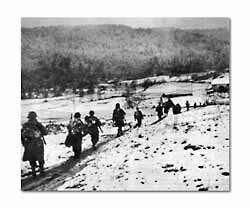 Recon MBs move slowly through the snow-draped Vosges Forests. Doughboys pack up their troubles and smile even in Vosges snowfall. As the Germans fell back before the 36th in the Vosges, they carefully prepared a strong line of defense along the Meurthe River. In this they resorted to unusual ruthlessness. Our forces first awakened to the fact when the dark skies of night turned to a glowing red throughout the valley. 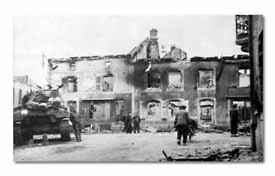 Patrols confirmed the reports of fleeing civilians coming into our linesthat Germans had set fire to entire villages on a broad path before their Meurthe River line. Civilians were systematically told to leave and their homes stripped of valuables before the torch was applied. Corcieux, fair-sized village in the valley, was an example. 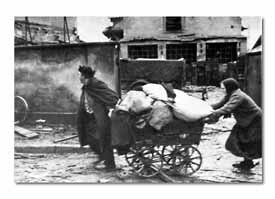 Hundreds of French civilians were left homeless.